You have added Gunmetal Grey Beaded Ivory Tulle Dress into shopping cart. FINAL SALE. We love the bold and unexpected neutral combination of this ivory dress paired with the gunmetal grey embellishments at the straps and waist. The Gunmetal Grey Beaded Ivory Tulle Dress is fully lined. The top part is made of a flowy, silky fabric. It has a fabric crossover detail at the bust, adding dimension to this look. The attached skirt is made of multiple layers of ivory tulle and is fully lined for opacity. The best part of this dress has to be the miniature gunmetal grey beads that decorate the straps and waistband of this dress, adding a touch of shine. A hidden back zipper completes this look. The Gunmetal Grey Beaded Ivory Tulle Dress would make a cute rehearsal dinner dress or bridal shower dress. 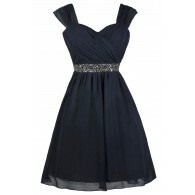 It would also be a cute option to wear to any dance or semi-formal event. We love the subtle ballerina-inspired touch of the tulle skirt. 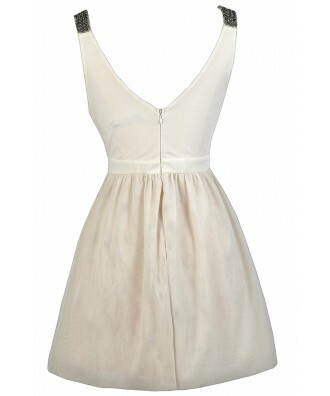 Pair it with ivory or grey pumps or metallic heels and a clutch. Details: Fully lined. Hidden back zipper. 90% polyester, 10% spandex. Contrast: 100% polyester. Lining: 100% polyester. Special dry clean only. Small measurements: Length from top of shoulder to hemline: 35". Bust: 34". 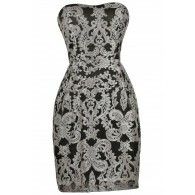 You have added Gunmetal Grey Beaded Ivory Tulle Dress into Wishlist. You have added Gunmetal Grey Beaded Ivory Tulle Dress for Stock Notification. 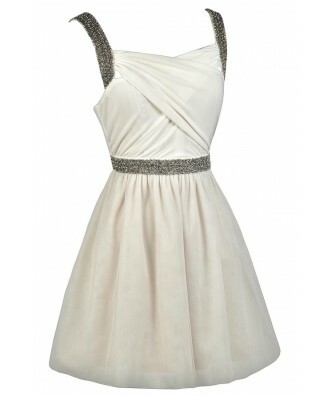 You have set Gunmetal Grey Beaded Ivory Tulle Dress as a loved product. 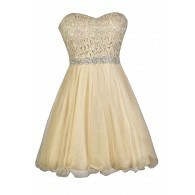 You have removed Gunmetal Grey Beaded Ivory Tulle Dress as a loved product.